We are delighted to announce that on September 5th, the Dante Musica Viva Choir will perform in a very special concert – trying to raise $100,000 for the Newborn Intensive Care Foundation at The Canberra Hospital. – A massed choir of 200 singers from the Canberra Choral Society, the Llewellyn Choir, SCUNA and our own Dante Musica Viva. All artists, performers and organisers are donating their talent and time so the maximum can be raised for the Foundation. 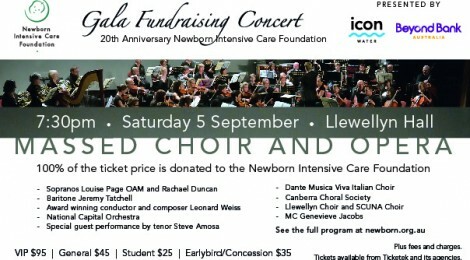 Genevieve Jacobs from 666 ABC Radio will host the evening and the timing of the concert is perfect as 2015 marks the 20th anniversary of the Newborn Intensive Care Foundation. We would like to encourage members of the Dante Alighieri Society to get behind this great cause, and to join us for a wonderful evening of Italian opera and other well-known arias and duets such as Adele’s Laughing Song from Die Fledermaus, Torna a Surriento, Nessun Dorma and Don Giovanni’s La ci darem la mano. Tickets are available from Ticketek, and 100% of the ticket price is being donated to the Newborn Intensive Care Foundation. Tickets available from Ticketek (just Google ‘Ticketek newborn’). With your help, we can reach our target of $100,000 and purchase a much-needed retinal scanner for the Neonatal Intensive Care Unit at The Canberra Hospital.